Power rankings be damned! Doctor Strange: Damnation may be the big event for March, but Rogue comes out as the Southern Belle of the ball and Black Panther streched his success into the new month. Rogue split her first ever “Hero of the Week” title with Black Panther. They both scored nine points and had three character-defining moments between them. 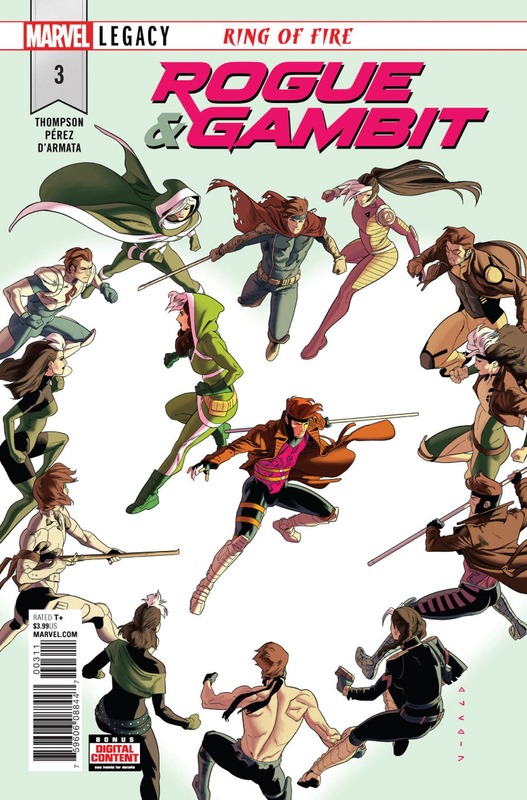 Rogue joined the new X-Men Gold team as well as rekindled a physical relationship with her paramour Gambit in their own book. T’Challa earned another “Hero of the Week” as his book explored the early days of Wakanda’s presence on the global scale. Two heroes followed close behind in third with eight points. Clint Barton received a boost thanks to an appearance in Doctor Strange: Damnation along with bigger points in his second appearance. Nadia Pym managed the same score while just appearing in only one book. The young Wasp starred in the latest Avengers title in which she saved the life of her father-figure, Jarvis. To many participants’ chagrin, the weekly Avengers book left a lot of the drafted Fantasy heroes out of the weekly action. She-Hulk goes out on a high note in her solo book, scoring seven points and fifth place. Captain America’s trip to the not-so-distant future earned him a trip to the sixth spot in the rankings with six points. Nightcrawler tied with a pair of Spider-characters for seventh place with five points apiece. Venom completed his team-up with the young, time-displaced mutants, but the threat of the Poisons remained. For the first time in a long time, none of the young X-Men were drafted in the League. In a low scoring month for all characters, many of the heroes clustered together with the same score. As such, seven heroes tied for tenth place with four points and rounded out the bottom of the power rankings. Ant-Man and Gamora represented the Guardians of the Galaxy’s return to the League, as well as the sole characters to score points in the Infinity Countdown book. Agents who took a gamble on characters like Adam Warlock and the original Wolverine were let down by the Infinity book. Beast and Lightning were the other two Avengers to show up in the weekly Avengers title and scored four points each, while Doctor Voodoo was absent from that book but scored the most points in the Damnation book. Phoenix and Winter Soldier also scored four points. Hero and power usages are a combination of all Fantasy Comic League divisions: Asgard, Danger Room, Knowhere, Latveria, Midtown, Multiverse and Wakanda. League participants should cross-reference the official points with their hero roster and drafted powers for their heroes’ scores. Please make sure to tweet any questions or comments to the official #FantasyComicLeague tag and @MixedMarvelArts for discussion!